This is Sandra. When we came to visit her, she wasn’t at home. We had to wait for her as she came early from work to meet us. She’s a hard worker who does her best to provide for her children. Sandra is a widow. Her husband passed away 8 years ago. His deceased husband struggled with alcohol and spent most of his days drunk, so he really wasn’t of any help to her. She is used to being independent and work hard to bring food home. She works in a coffee plantation where she does labor and helps to gather coffee beans from the coffee plants. She leaves early in the morning and comes back late a home. She works long hours and receives very little. She has three children. Sucely is the oldest and sadly, she’s not in school. She works, just as her mom so she can bring some extra income to help with the family expenses. Then there’s two boys: Juan Carlos and Jorge. They do attend school. Sadly, Jorge has learning disabilities. It has been a challenge for him to be in school. Not only he was having a hard time trying to keep up with his classes, but he was constantly being bullied because of his learning problems. Sandra had to change him into another school which is farther from home. This school is for children with learning disabilities. That implies more expenses, as the school is more expensive, plus transportation costs and time needed to drop him off at school. The good news is that he greatly improved in his education, so Sandra thinks it is worth it. 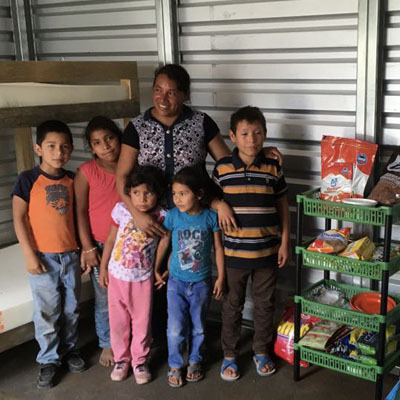 The blessing of the Milcasas house has helped Sandra, Sucely, Juan Carlos and Jose have a warm place to sleep. 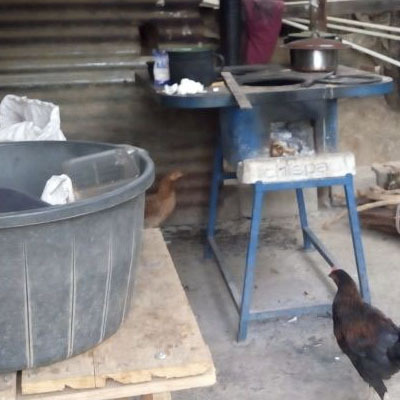 With their new house, what used to be cold nights with insecurity has changed. 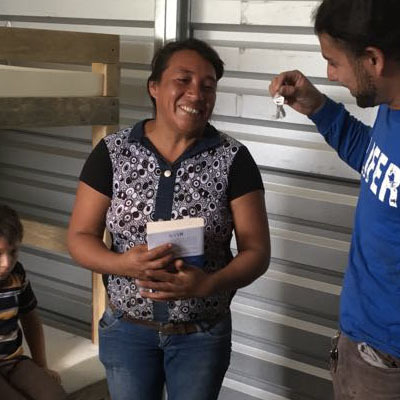 Their humble shack, full of holes now is a home with a concrete floor, a set of bunk beds, a fuel-efficient wood stove, solar lighting and a water filter for clean drinking water. The new home also features an extended roof where Sandra has her kitchen. 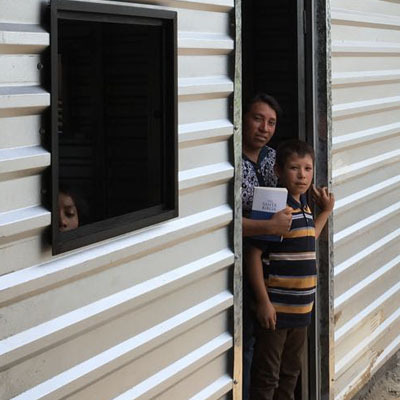 This house was a free gift to Sandra and her children, just as Jesus offered us free salvation. Thank you for your faithfulness and willingness to share it in a real way. James 2:17 – In the same way, faith by itself, if it is not accompanied by action, is dead.